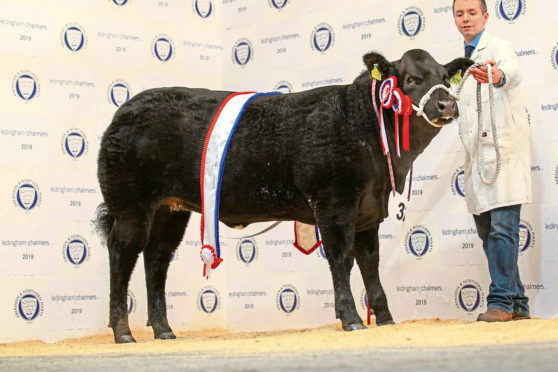 Ally Fraser, Easter Clune, Lethen, has competed for 15 years and ruled supreme with a black Limousin cross heifer bred by George Macarthur, Mid Fleenas, Nairn, which he bought for £1,520 in October. Crossing the weighbridge at 516kg, this March 2018-born heifer is by Beulah Joblot, out of a Limousin cross British Blue dam. She sold to Blair Duffton, Huntly. Keith YFC member Gary Morrison from Bush of Muldearie, Mulben, enjoyed a good year, winning the Calladrum Cup for the best overwintered animal. Selling for the next best price of £1,950 and producing a profit of £950, was the second prize heifer, a January 2018-born Limousin cross bred by JJ MacDonald, South Uist. Weighing 522kg, she sold to Jim Baillie, Sebay Farm, Tankerness. Gary produced a profit of £680 for a February 2018-born Limousin cross heifer bred by Bill and Garry Patterson, Upper Forgie, Keith. Selling for £1,450 to the judge, Craig Malone, Pitcairn, Cardenden, Fife, this 454kg heifer stood second in her class. A 10-month-old Limousin cross heifer from Lower Speyside YFC’s James MacIver, Wester Coltfield, Kinloss, made £1,820 to a phone bidder. Bred by Gordon Cameron, Newton Cottage, Acharacle, she stood first in her class and weighed in at 446kg. The champion bullock from Mark Robertson, Easter Fodderletter, Tomintoul, sold for £1,450 to Backmuir Livestock, Keith. This was a 542kg, December 2017-born Limousin cross by David Scott, Grutha, South Ronaldsay. Selling for £1,400 was the second prize unhaltered bullock from Deer and District member Craig Buchan, Nether Savoch, Longside, Peterhead. Bred by the Munros at Invercharron, he weighed 612kg and sold to Bill Cameron, Burnside of Edingight, Grange, Keith. Gary Morrison also sold his home-bred champion for £1,350 to Harry Brown, Auchmaliddie Mains, Maud. This was 18-month-old pedigree Limousin heifer Muldearie Nicole, by Springwood Enzo. The novice award was won by Lower Speyside YFC member Harry James Ross, Coldholme Farm, Dallas, while the junior young farmer award went to fellow club member, Graeme Rhind, Newton of Struthers, Kinloss. Lower Speyside Young Farmers Club won the overall club title.